To begin, as I do every year, with my standard disclaimer: This may be my list of the Top 10 Movies of 2015 – but it’s not necessary a rundown of the year’s 10 Best Movies. Because, quite frankly, I haven’t seen every single movie released anywhere in the U.S. during the past 12 months. But this most certainly is a list of my favorite films to open in U.S. theaters in 2015. These are, of course, purely arbitrary and totally subjective choices. And I’ll freely admit that, a decade or so hence, I might look back on the following lineup and want to make additions or deletions. At this point in time, however, I can honestly state these are the 2015 releases that impressed me most. And best. So there. Assassination -- Choi Dong-hoon's thrilling period drama, set in 1933 Korea during the Japanese occupation, is a sensationally entertaining mash-up of historical drama, Dirty Dozen style shoot-‘em-up, Spaghetti Western-flavored flamboyance, and extended action set pieces that suggest a dream-team collaboration of Sergio Leone, John Woo and Steven Spielberg. Wowser. Best of Enemies -- A thoroughly engrossing and surprisingly entertaining documentary about the notorious 1968 televised clash between conservative icon William F. Buckley Jr. and liberal gadfly Gore Vidal. It's fascinating as a glimpse at the not so distant past -- and provocative as an account of what arguably was an early step in the decline of political discourse on television. The Big Short -- Adam McKay's brutally brilliant dramedy about the catastrophic 2008 financial meltdown is by turns hilarious and horrifying, amusing and infuriating. Call it the year's most essential movie, and you won't get an argument from me. The Hateful Eight -- Quentin Tarantino's shamelessly overstated and immensely entertaining revisionist Western truly is a movie with something to offend everyone. But it's also a balls-out masterwork of robustly impolite swagger. I Believe in Unicorns -- Filmmaker Leah Meyerhoff's debut feature is a sensitively observed and arrestingly impressionistic coming-of-age drama that feels at once deeply personal and easily accessible. But wait, there's more: Natalia Dyer gives an unforgettable performance as a fantasy-prone teen who falls for a bad boy (Peter Vack) laden with emotional baggage. Spotlight -- The very best movie about investigative journalism since All the President's Men? Absolutely. Star Wars: The Force Awakens -- A wonderment, pure and simple. Steve Jobs -- Director Danny Boyle and screenwriter Aaron Sorkin elicited many comparisons to Citizen Kane with their stylistically audacious and dramatically compelling film about the complex and controversial Apple co-founder. And with good reason: Much like Orson Welles' classic, their multifaceted portrait reminds us that some people, no matter how much we discover about them, will forever remain elusively unknowable. Trainwreck -- Judd Apatow strikes again -- and, better still, launches Amy Schumer's movie stardom -- in a wild and crazy rom-com (which Schumer scripted) that deftly balances uproarious R-rated hilarity and stealthily endearing sincerity. Youth -- Michael Caine very likely has other great performances left to give, because he is, after all, Michael Caine. 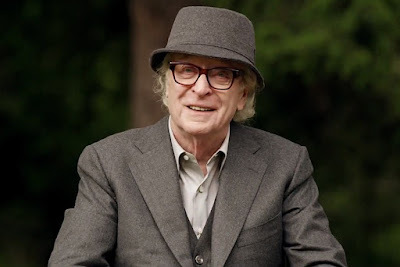 But it is difficult (albeit not impossible) to imagine that any of those performances will be greater than the one he gives in Paolo Sorrentino's exquisitely crafted and profoundly affecting drama as Fred Ballinger, an 80-something retired composer-conductor who discovers, much to his surprise, he continues to derive fresh satisfaction from his art -- and his life. Runners-up, in no particular order: Brooklyn, The Lesson, All Things Must Pass, The Revenant, Slow West, Bone Tomahawk, Mad Max: Fury Road, Creed, Inside Out and The Winding Stream: The Carters, The Cashes and The Course of County Music.